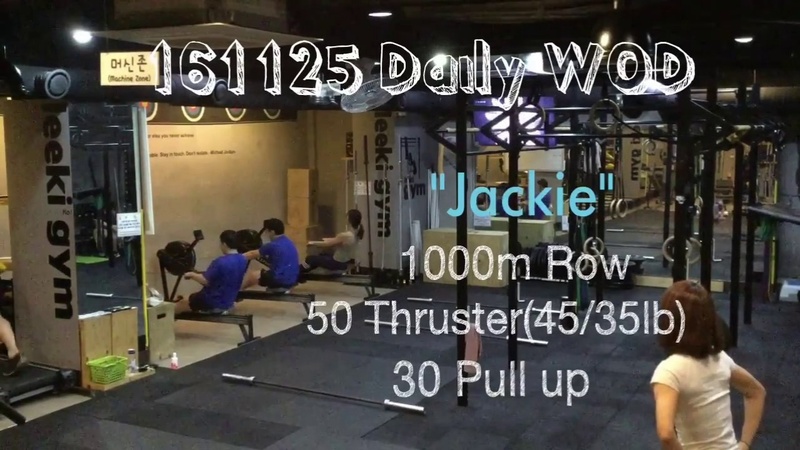 Add a video for "Jackie"
"Jackie," one of the classic CrossFit Girl WODs, was originally posted on the CrossFit Main Site as the workout of the day for Friday March 6, 2009 (090306). Some people do this workout with the prescribed (Rx) bar weight for both men and women 45 lb - as opposed to 45 for men and 35 for women, which is typical scaling for a modern CrossFit workout. This discrepancy in the standard is due in part to the fact that when the workout was first posted in 2009 CrossFit did not post male and female Rx weights (they posted only one prescribed weight for most workouts). Also, when "Jackie" was performed at the 2013 CrossFit Games Regionals, the prescribed bar weight was 45 lb for both men and women. Later, it became more common to see typical prescribed bar weights of 45/35 lb for male/female athletes, and when CrossFit posted a variant of the workout in 2017 (170930) Rx weights were 45/35 lb bars. See also: "Running Jackie" (which substitutes a run for the row), the more advanced "Angry Jackie," and the "Backwards Jackie" WOD also known as "Eikcaj."